Jerusalem, August 3, 2016 — The idea that plasma high-density lipoprotein cholesterol (HDL-C) is protective against coronary heart disease has been part of medical conventional wisdom for five decades. HDL-C has traditionally been considered the most important component of so-called “good cholesterol” HDL. However, drug trials that increased HDL-C have failed to support a causal role for the amount of cholesterol carried in HDL in reducing the risk of coronary heart disease. With advances in the separation of lipoproteins by size and functionality, research has intensified to identify HDL measures that may be better predictors of coronary heart disease than the traditional HDL-C. Recent evidence suggests that small, dense, protein-rich particles in HDL may be more atheroprotective than large, buoyant cholesterol-rich particles. To explore this further, 274 Arabs and 230 Jews residing in Jerusalem were recruited for a new study by researchers at the Braun School of Public Health in the Hebrew University of Jerusalem’s Faculty of Medicine. 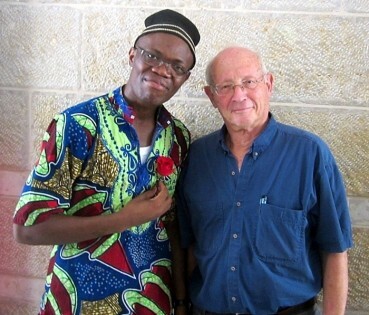 This work, led by Prof. Jeremy Kark of the Hebrew University-Hadassah Braun School of Public Health and Community Medicine, was undertaken by Dr. Chobufo Ditah, a physician from Cameroon, as his thesis for the Braun School’s International Masters of Public Health (IMPH) program. The researchers used Nuclear Magnetic Resonance (NMR) spectroscopy to identify the numbers and sizes of plasma HDL particles, and helical CT-scanning to identify calcification in their coronary arteries, reflecting the overall burden of coronary atherosclerosis. With these data in hand, they looked for associations between the concentrations and sizes of different HDL particles, and coronary artery calcification. Their findings, published in the prestigious journal Atherosclerosis, showed a statistically significant inverse association of both the number of HDL particles (HDL-P) and the concentration of small and medium-sized HDL particles (MS-HDL-P) with coronary artery calcification, after adjusting for age, statin use, smoking, and other factors. There was no association between large HDL-P and coronary artery calcification in either population group. The association with HDL-C was weaker and inconsistent between men and women. “Our findings indicate that HDL-P and MS-HDL-P are better independent markers of coronary artery disease, as reflected by coronary artery calcification, than HDL-C, at least in this bi-ethnic population of Israelis and Palestinians,” said Dr. Chobufo Ditah. “With a better understanding of HDL’s complexity and a better ability to measure its components, it is now possible to move past HDL-C to more refined measures that better reflect HDL’s role in coronary heart disease risk. Based on the accumulating evidence, incorporation of MS-HDL-P or HDL-P into the routine prediction of coronary heart disease risk should be considered,” said Prof. Jeremy Kark. “These findings support previous reports, based on studies in other population groups, suggesting that small dense HDL particles are protectively associated with risk of coronary heart disease. The consistency of this finding in a new population of urban Arabs and Jews, using different disease outcomes and different separation methods, add more strength to those findings,” added Dr. Ditah. Participants in this research are affiliated with the following institutions: Hebrew University-Hadassah Braun School of Public Health and Community Medicine; Hebrew University Faculty of Medicine; Hadassah Medical Center, Ein Kerem, Jerusalem; Mankon Sub-Divisional Hospital, Cameroon; LipoScience, Laboratory Corporation of America Holdings, USA. The Hebrew University-Hadassah Braun School of Public Health and Community Medicine in the Hebrew University’s Faculty of Medicine, is the first school of public health in Israel. Its world-renowned International Master’s in Public Health (IMPH) program graduated its 40th class in 2015, featuring a diverse student body ranging from Cameroon to Kosovo, the United States to Jerusalem. The International MPH degree has been awarded to more than 800 graduates from 92 low-income countries in Africa, Asia, Latin America, Eastern Europe, as well as developed countries of North America and Western Europe. The comprehensive multi-disciplinary 12-month training experience prepares graduates to take up key positions as leaders and teachers of public health in their home countries, and to initiate and participate in the promotion and development of public health practices and develop capacity-building programs for training public health personnel.